Many of you who frequent Crochetville saw this afghan when Sutty received in May, but I wanted to share photos here as well. and myeslf. 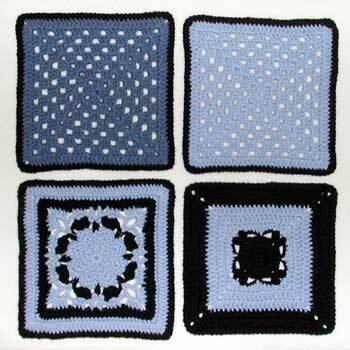 Trish did the real labor of joining the squares and she also packaged the ghan and sent it to Sutty. Thanks, ladies for all your hard work! I know Sutty appreciates it! Photo by Trish, used here with permission. 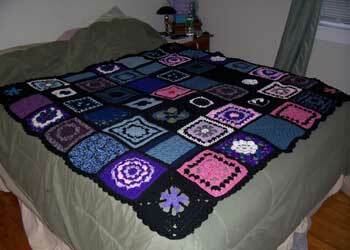 another beautiful comfortghan! great job to you all! It was nice everyone working together and I know Sutty appreciated it! Thanks for posting the pictures. This was the most rewarding project I’ve worked on. Although it took MUCH longer than I had expected it to take, I’m so grateful to have been a part of it. Thank you everyone for your love and hard work. I very much like the bottom left square. That’s lovely.